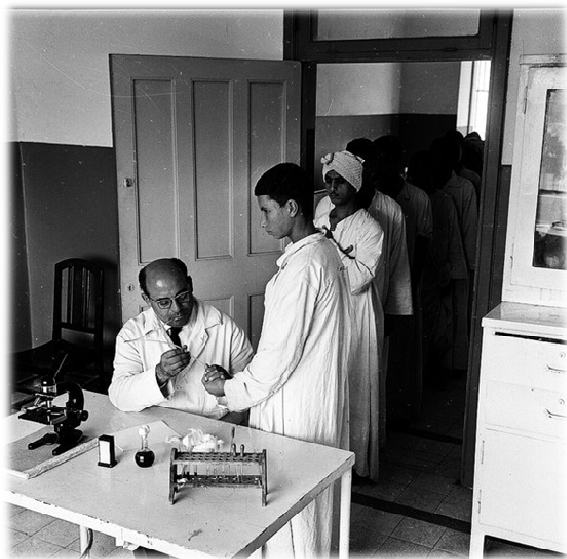 Over the last three or four decades, more than six million Egyptians have contracted hepatitis C during campaigns for the eradication of schistosomiasis where the same syringe was often used to take blood from more than one patient. The hepatitis C virus was spread insidiously. Today, Egypt has the world's highest incidence of hepatitis - about 9 million people; 10% of the population. Some pharmaceutical companies plan to sell new and expensive drugs for the treatment of hepatitis C at cost price in developing countries, while maintaining their lucrative business in developed countries. The Egyptian project could serve as a model for the future supply of expensive drugs to poor countries. This encouraging project has only been in action for a year. An Egyptian patient with hepatitis C obtains Sofosbuvir (Sovaldi®), and the treatment costs $900. The same treatment would cost US $ 84,000, and an average of € 60,000 within the European Union. Hepatitis C is a global health problem. The worldwide prevalence of infection is estimated at 150 million; four times more than people infected with HIV. Annual mortality is estimated at 500,000 due to cirrhosis of the liver and liver cancer. The hepatitis C virus is a resilient enemy, transmitted by contact with contaminated blood. Infection may be asymptomatic for years, even decades. In some patients the infection disappears spontaneously, but it is more common for the virus to remain latent giving rise to chronic infection, causing progressive and irrevocable damage to the liver. Egypt is the place where the infection is most firmly entrenched, with approximately 150,000 new infections a year, due mainly to the re-use of needles, accidental pricks, and the use of contaminated medical devices for invasive procedures, but also such banalities as the sharing of nail clippers and toothbrushes among members of the same family. On average, it is estimated that every Egyptian infected with hepatitis C acts as a vector for three others, according to Egypt's National Liver Institute, which has about 50 treatment centres across the country. The treatment for this infection consumes a third of the national health budget. There is concern at the popular barber’s shops in Cairo, to such a degree that many customers bring their own razor blades, scissors and even gloves. But the infection is so widespread that the virus remains viable on objects days after contact with someone infected by the virus. The prevalence of infection is at its highest in the populations of the Nile Delta surrounding Cairo, where almost half of all men over 50 years of age are infected. An additional problem is that many patients with liver fibrosis resulting from advanced hepatitis C have to wait months for access to treatment, by which time it is no longer possible to reverse the latter-stage complications of the infection. Egypt has a relatively effective health service, much better than many countries with similar standards of living. In an attempt to repair the damage caused decades ago during the campaigns to eradicate schistosomiasis, in 2007 the Ministry of Health launched an ambitious project for the treatment of hepatitis C using two classic drugs: Interferon and Ribavirin. Both drugs are associated with a significant iatrogenic load. Everything changed last year, in 2014, when the American pharmaceutical company Gilead Sciences offered a better alternative treatment for hepatitis C: Sofosbuvir, which had been marketed as Sovaldi® since 2013 at a truly prohibitive price - $ 1,000 per dose. The classic treatment (Interferon and Ribavirin) takes 12 weeks, whereas with Sofosbuvir, 4 weeks of treatment are enough (and a little longer in areas with a high prevalence of infection). Sofosbuvir is a real blockbuster, giving a profit of about $10 billion to the manufacturer, Gilead Sciences. After receiving fierce international criticism for the elevated price of the drug, Gilead Sciences began selling Sofosbuvir to the Egyptian government at a cost of $10 per tablet. The government passed it on to Egyptian pharmacies, which dispense it free of charge. In addition, Gilead Sciences also allows 11 Indian laboratories and 2 Egyptian manufactures to produce Sofosbuvir under license. Gilead Science does not have any say in the trading price, but get a royalty of 7% on the selling price. Dr. Wahid Doss, head of the National Committee for Control of Viral Hepatitis, rejected Egypt’s Application for a patent presented by Gilead Sciences, making it possible to market generic versions of Sofosbuvir. Gilead Sciences argued that its patent application was in order to limit the illegal sale of the drug. 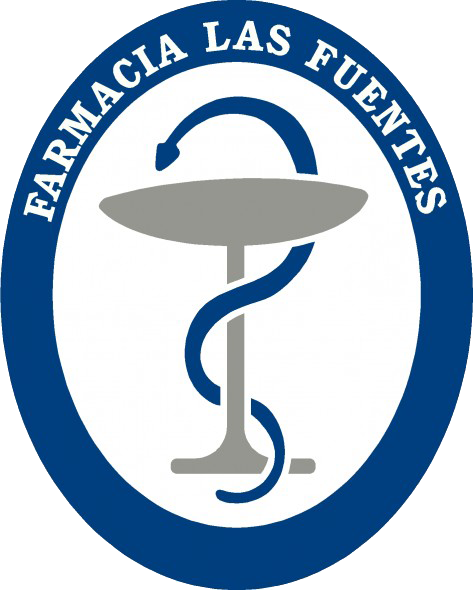 All patients have to purchase the package at pharmacies, break the seal and take the first dose in the presence of the pharmacist to avoid, insofar as possible, the reselling of the package on the black market. If it is necessary to continue the treatment, prior to receiving a new package at the pharmacy, the patient has to hand in the empty container which had been given to him. Some pharmacists, especially those sympathetic to the association “Egyptian Initiative for Personal Rights”, appear contrary to this practice, considering it to be humiliating for patients. Médecins Sans Frontières was also against this approach, arguing that it is an intrusion on the "doctor-patient relationship." However, patients are not usually concerned with such ethical issues. Some claim that this procedure gives them more security, and encourages them to resist the temptation to sell the medication in order to gain additional income to supplement their impoverished economies. Egyptian health authorities are taking measures to prevent medication purchased by the government ending up being smuggled illegally. The Egyptian government's ambitious project aims to treat 300,000 patients in 2016, and ensure that the incidence of hepatitis C does not exceed 2% by 2025. The first year of the program (2015) was a success. A total of 125,000 patients were treated with Sofosbuvir. Today, generic versions are available as low as $4 a tablet (compared to $1,000 in the US). Sofosbuvir, in association with Ledipasvir, marketed as Harvoni®, which attained significant cure rates without using Interferon or Ribavirin, will be marketed in Egypt for $14 per day of treatment. The agreements between Gilead Sciences and the Egyptian government are being emulated by other large pharmaceutical corporations. In August 2014 the Egyptian government announced the import of a pharmaceutical preparation Viekira® by Abbvie, at $13 per day; a mere1% of its cost on the US pharmaceutical market. In order to avoid their introduction of Viekira® onto the black market in Egypt, Abbvie will register it under another name, Qurevo®. From October 2014 the Egyptian government began importing Daklinza® (Daclatasvir), another drug against hepatitis C, manufactured by Bristol Myers Squibb. Hepatitis C is one of the most prevalent diseases in the world, and decisive new drugs to treat this infection are among the most expensive in the world, a situation that has been the subject of bitter criticism in several forums. Gilead Sciences’ position regarding the price of Sovaldi®, Harvoni® in Egypt is to make amends for the bitter experience in the early days of the AIDS pandemic, when millions of poor affected countries had no access to medication because they were prohibitively expensive. By 1997, South Africa was suffering the world's highest incidence of AIDS. The South African government passed a law suspending patents, leaving the door open for the acquisition of generic versions of antiretroviral drugs. The pharmaceutical companies reacted by closing some of their manufacturing plants in that country and threatening to stop selling their products there. They also decided to sue the then President, Nelson Mandela. Intervention by the then Secretary General of the UN, Kofi Annan, was able to resolve the situation. But the tactics employed by the pharmaceutical companies severely tarnished their reputation. They learned their lesson, and current more cooperative attitude towards the Egyptian government has a great deal to do with what happened in South Africa. Poor countries obtained substantial reductions in the prices of antiretroviral drugs. This was a great boost to the development of the generic industry in India. In fact, nearly 100% of all antiretroviral drugs used worldwide today are manufactured in India at a cost as low as $100 for a year’s treatment. This creates programs as dynamic as the Global Fund and the President's Emergency Plan for AIDS Relief, which have made treatment for HIV infection possible for more than 14 million people. Gilead Sciences, who were, at first, extremely reluctant to the transfer patent rights, eventually cooperated with Indian generic drug industries, freeing the patent for Tenofovir thus enabling its distribution in Africa limiting royalties to only 5%. Gilead Sciences’ fears that the European and North American pharmaceutical market would be inundated with Tenofovir from emerging markets, but this has not happened. Returning to hepatitis C drugs, Gilead Sciences has, however, reserved two very substantial markets, Russia and China. It is estimated that together these two countries have over 73 million people with this infection. The agreements signed by Gilead Sciences and the Indian government establish that generic versions of Sofosbuvir can only be sold to the 91 poorest countries in the world. Last August, Gilead Science added ten nations to its program of favourable access to its drugs against hepatitis C, including Brazil and Argentina, which will market Sovaldi® at $10, and Harvoni® at $14 per dose. Some Egyptian health authorities are concerned that the emergence of too many manufacturers of generic versions of these drugs could lead to an uncontrolled hepatitis C programme. Egypt has thousands of small pharmacies which are barely regulated. Drugs are sold over the counter, but while the government sets the prices of the drugs prescribed by private doctors, pharmacists often charge whatever they see fit. Although the Egyptian government respects their agreements with US multinationals, this regulation is ineffective within the retail businesses of countless tiny pharmacies all over this vast country which is twice the size of Spain. 1. Lopez Tricas, JM. Sofosbuvir to New Drug against Hepatitis C. European Journal of Clinical Pharmacy 2014; 16 (4): 235-236. 2. Herbst DA, KR Reddy. 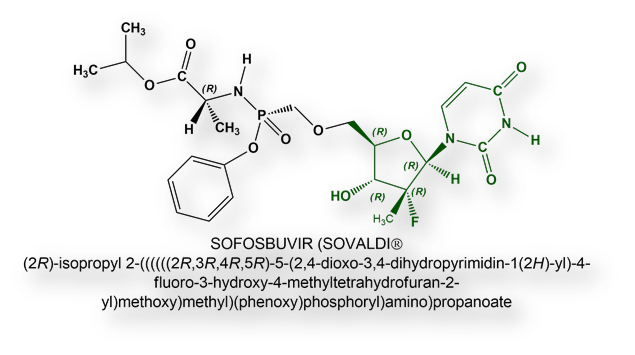 Sofosbuvir, a Nucleotide Polymerase Inhibitor, for the Treatment of Chronic Hepatitis C virus Infection. Expert Opin Invest Drugs 2013; 22: 527-36. 6. Lopez Tricas, JM. Viekira pak® Hepatitis C and the Pharmaceutical Market. European Journal of Clinical Pharmacy. 2015; 17 (5): 299-300. 7. I. Gentile, et al. Ledipasvir: a Novel Synthetic Antiviral for the Treatment of HCV Infection. Expert Opin Invest Drugs 2014; 23: 561-71. 8. Herbst DA, KR Reddy. NS5A Inhibitor, Daclatasvir, for the Treatment of Chronic Hepatitis C Virus Infection. Expert Opin Invest Drugs 2013; 22: 1337-1346.